I can use all the help I can get raising my kids to know and love Jesus. That’s why I’m glad to have resources from fellow moms to help me navigate faith with my kids. Susan Shipe recently self-published a valuable resource that helps parents and kids learn about Jesus. 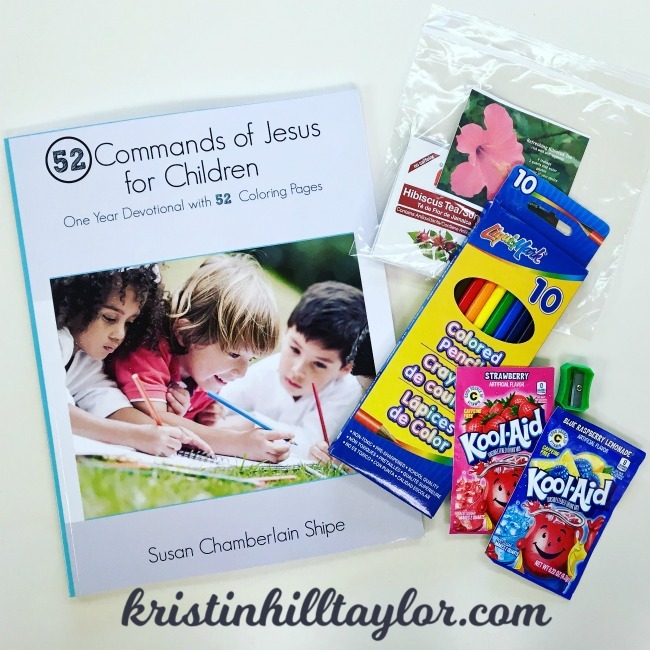 She specifically highlights His commands and character in “52 Commands of Jesus for Children,” which also includes coloring pages with each weekly devotion. As an extra treat, Susan provides extra coloring pages as free downloads at her site. This book is a 52-week devotion-journal for parents to use with their children. Each week teaches a command and character quality. Parents, use the scriptures and the questions to probe the deep things with your children, in your own style and convictions. All scripture is taken from the New Living Translation and most of the scriptures are quotes from Jesus Christ Himself. As an 8 year old, Susan Chamberlain Shipe and her neighborhood friend wrote, edited, published, and distributed The Manor News. Things have changed since publishing with the five and dime stamp lettering set, but she’s still a writer. Today, Susan enjoys blogging and writing short devotions and short stories from her empty-nest home in the Appalachian Mountains of northwestern North Carolina, which she shares with her husband of 30-plus years, Lowell, and their beloved dog, Sam. Susan can be found musing several times a week at hopehearthome.com. And Susan has graciously agreed to give away a copy to one of you! If you’re interested in entering to win, just leave a comment below about how you have helped your kids (or kids in your life) navigate faith. Resources and tips are welcomed. I’ll randomly choose a winner on Tuesday, June 20. I received a free copy of this book in exchange for being on the launch team. I am in awe of this woman! Thanks for sharing her work here as well as some of her story — and thanks, Kristin, for your faithfulness in this space! She’s a good one. 🙂 Thanks for your faithfulness here, Michele! Hi Kristin. I received the same package from Susan. Isn’t she generous and talented? I’m doing a post on this next week. Blessings to you and your family! Yes, I second that! Thanks for being here, Sarah! I’m so happy to know about this resource! I help my kids in their faith by being available and asking questions. My kids have lots of biblical instruction through their school and church, so I just always talk them through what they’ve learnt and try to spot any areas they need more help with. Yes, being available is so important, Sarah! Thanks for being here! Excited for Susan and this book. What a great resource for families! This sounds so neat! Whether it is books, music, friends, activities…I try to surround my kids as much as possible with godly influences. yay! what a fabulous idea! it fits right in with a book about teaching in the church I recently read twice because it was packed full of ideas and insights and I’m even getting ready to review. Currently I facilitate adult SS at my church, but in previous lives I’ve taught every age (after telling the VBS director “please, no one under 3rd grade,” even a mixed-age VBS group that included 4 and 5 year olds a few years ago), but middle school’s prolly my fave. Back later! A sermon series at Susan’s church inspired this devotional. I’m glad you’re here faithfully, Leah! This looks like a wonderful teaching resource to point our children to God! Yes, indeed! I’m glad you’re here, Jennie! I can’t wait to get started on my copy! Kids get out of school tomorrow and it’s first on the list! Hooray for summer! 🙂 Hope y’all enjoy it too, Becky! We incorporate how God made things like the animals and us, rainbows, clouds, etc in our everyday life. Us too! That’s one reason I love the kids’ classical curriculum at school. Thanks for being here, Mandy! Wish I had a few kids. I will have to wait for grandkids. Looks great. Thank you for the linkup. Thanks for being here, Maree!